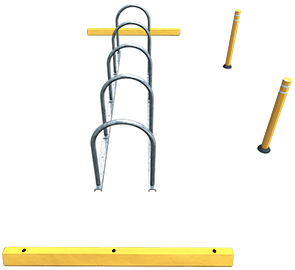 On-street bicycle parking is becoming the desired choice for urban spaces. 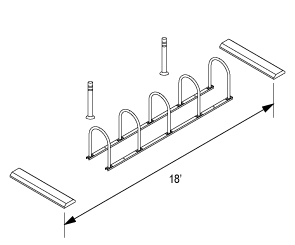 Designed to efficiently maximize space, Cycle Stall Basic bike corral provides all the tools necessary to create safe, secure on-street parking for 10-22 bicycles. 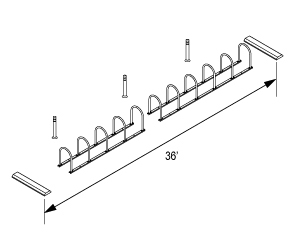 Constructed with strong, commercial grade materials, the Cycle Stall features U-Lock compatible rail-mounted Hoop Racks, recycled plastic wheel stops and 48" traffic delineators. Implementing the Cycle Stall opens sidewalk walk areas, increases street visibility of businesses, builds neighborhood identity and provides means of alternative transportation for employees and the community.